Hey!! 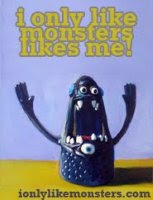 Your monsters and ceramics look GREAT!! Is it a secret as to what type of black glaze you use to make those crisp lines on your mugs and bowls? They are so graphic and awesome.